You have an idea for a novel. It’s been floating around inside your head for months. It’s all you think about. You eat, sleep, and dream it. In fact, you feel like you’ve already lived it. Surely you must be ready to start writing, right? Creating some two hundred plus pages of a story is no easy feat. Trust me, I know. My first novel went something like this: Get idea, open laptop, start typing. And what happened? I wrote myself into a corner on more than a couple of occasions. Sound familiar? Of course it does. That’s why, before any writing commences, we first have to plot. I’ll be honest, I never used to be a believer of this method. And to back-up my argument, I always referred back to a Roald Dahl interview I saw (now decades ago), where he also admitted he never plotted. He just ‘kinda made it up’ as he went along. What better author to quote? So, armed with just my laptop, off I set on my journey to write my first novel. One thing I am a big believer in is that you have to learn my your mistakes… and boy, was this ever a learning curve for me. “I distrust plot for two reasons: first, because our lives are largely plotless, even when you add in all of our reasonable precautions and careful planning; and second, because I believe plotting and the spontaneity or real creation aren’t compatible.” -Stephen King. One thing I am certain about, though… For me, plotting was a life-changer. Plotting is your entire story from start to finish in ‘note’ form. For this post, I’ll go with how I plot. First, a quick explanation of what a 3-Act Structure is. Simple, but for a more in-depth look at the 3-Act Structure, see Part Eight. 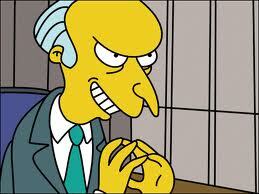 Okay, back to plotting. Now, although plotting and the 3-Act structure go hand-in-hand, we’re just going to concentrate on the plotting side of things for the time being. 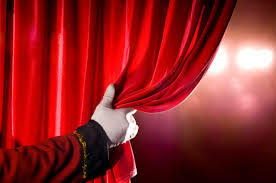 First, I break each scene down into three parts that I like to call ‘Scene Structure’. These three parts involve the Character’s Goal, the Obstacle they have to overcome, and how they Resolve it. Column 1 – Chapter Number, Day, Time. 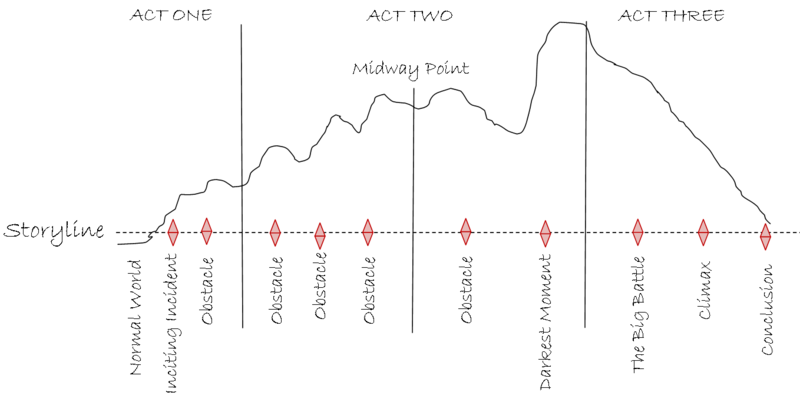 Column 2 – Location, POV, Brief (Quick glance) Scene Outline. 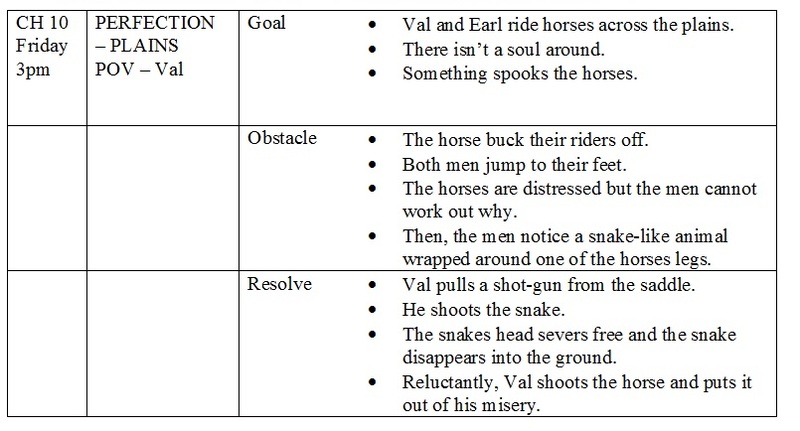 Column 3 – Scene Structure (Goal, Obstacle, Resolve). Column 4 – Scene Description. Column 1 and 2 is purely for my own information as saves me from having to scroll back through my novel every time I need to check who did and said what, why, and when, etc. Column 3 is my scene breakdown, which I explained less than a minute ago. Column 4 is the all important description. The scenes within each Act should be as detailed as possible. Writing – *Girl works, *Girls gets attacked, *Girl survives, and *Girl is in danger, may do the job but it is the quick and lazy option and won’t help you much when the time comes to writing your novel. Instead, write in-depth scenes. Include character feelings, any dialogue you would like them to say, mannerisms – basically anything you don’t want to forget later on. By using this method, (or something similar), it enables you to easily change and alter earlier events if later events call for it, and vice-versa. Research – With the wealth of information that is the internet, there is no excuse not to know what you are writing about. Good research equals a more realistic story. Coincidences – Every character needs a valid reason to do what they do. Coincidences are convenient. Using ‘Just because’ is lazy and will annoy your reader and spoil your story. Large Cast – Just as too many cooks spoil the broth, too many characters ruin the story. Asking your reader to remember every character and their cousin, from postman Pete (who appears once), to the little boy fishing by the stream, will confuse your reader and give them brain-ache. Cut those little darlings. Plot Diversion – Don’t let your story drift off course and disappear into a one way street. Stick to the story. Ignore those road diversions. So, are you a plotter or a pantser? Do you plot or do you fly by the seat of your pants? If you already plot, what kind of techniques do you use? Do you use in-depth tables and graphs, or do you bullet point simple points? I’ve been writing for a few years now and it still amazes me at how much I don’t know. This week I was going through the edits on my novel when my good mate and fellow writer, Piper Bayard, pointed something out to me about new scenes and paragraphing. She, too, only discovered this ‘must-do’ last year. So, I thought it would be helpful to lay out some of the things I have learned over the last few years that writers must know when writing a novel. The below points are what publishers and agents expect to see from writers. Font: Always use Times New Roman. It is easy on the eye and makes it easy for the reader to read. Size: Although it’s commonly said that size doesn’t matter – this time it does. 12pt is the size everyone wants. Line Spacing: Some use double line spacing, most want one and a half. This allows room for any notes and editing. Margins: Leave one inch for both the left and right margins. Again, this space is for any notes or editing. The cover page is a blank sheet of paper that, when asked for, usually lists the title of your book, your name, contact details, and the word count. When submitting your novel you must read the guidelines as sometimes agents and publishers require different information. It is imperative that you use your header to display your name, novel title, and page number. Without this information, if your novel is dropped how will the reader be able to put it back together again? Chapter Heading: Space down six (one and a half) lines. The heading can be in capitals or underlined. Sub-Title: If you want to add a sub-title of a place, time, year, etc., then add it before you begin your story. This can be underlined, typed in italics, or in bold. There is no indentation. First Paragraph: For the first paragraph in a chapter, there is no indentation. 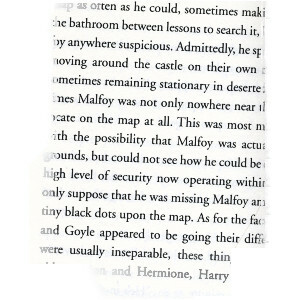 Further Paragraphs: Following paragraphs are indented one inch throughout the scene. Justification: Never justify your work. Aline your type to the left. Almalfi Cathedral, Campania. Italy – Monday. The uncomfortable harness cut into his groin. ……….The thief shifted position, tried to ignore the dull ache as best he could, and listened. ……….Three bloody hours he’d been hanging here in the dark, just listening. N.B. New Scenes: If starting a new scene in a chapter, then as at the beginning of a chapter, no indentation is needed. ……….Eliza rest her head back against the pillow. Her head hurt and she no longer had the energy to argue anymore. The young boy nodded and disappeared from sight. Her father waited a second, as if to bask in his triumph and remind her who was boss, then also left the room. It was just before lunch when Nate made it to the records office. He parked in the unusually empty car park and got out. Removing his sunglasses, he strolled along the brick paved path to the front of the building and pulled the doors where they shuddered and remained closed. Well, these are the basics to laying out your novel and enough to get you started. And now it’s your turn. What are your pet hates? What is the worse mistake you’ve ever made when typing and submitting a manuscript? Maybe you have a question to ask about the manuscript you are currently writing, so feel free to type it in the comments. Animal Love…. Or Just Plain Craziness? Now, I must just clear this up first. My sister and I are both animal lovers. As children, we always had animals which included dogs, cats, terrapins, gerbils, hamsters, fish… the list goes on and on. Yes, now we are the skivvies, er, slaves, er, mums. But being a know-it-all, I have ignored all her advice. My son, Jamie, has been begging for an animal for the last few years, and he doesn’t care what kind. So, the elimination process began. First, hubby is scared stiff of dogs, horses, and parrots (go figure! ), so they were first off the list. He is also allergic to cats. Strike two. Fish? Na. He can’t cuddle a fish… although I wouldn’t put it past him to try. Rabbits? Nope, I could not leave them outside – it just feels wicked. So, that left rodents. Now, gerbils are too quick, and trust me when I say I know this from first hand experience. 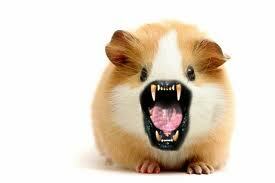 Hamsters are really blood chomping vampires in disguise, and again comes in the first hand experience. So I opted for an adorable, cuddly guinea pig. Sorted. But, and the whole point of this blog, was the story my sister told me during this conversation. It was about her fish, who is now like Jaws. 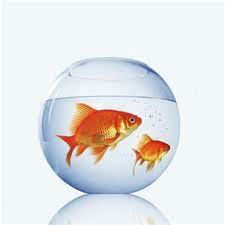 She had gone away on holiday and while away, the fish tank pump broke. When she returned, the water was green and the fish was lying on its side. She grabbed it, lay it flat, and proceeded to give it mouth to mouth. 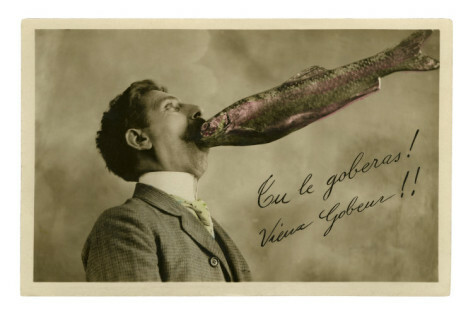 The story went like this, “I breathed into its mouth then dipped it in the water. Breathed into its mouth, then dipped it in the water. And it lived.” It is still alive today, and now bigger than ever. Apparently, this isn’t an isolated incident. Check out this news story. So, my question to you is – how far would you go to save a pet, or an animal? Is there a line that even you would not cross. Have you ever done anything like my sister? Let me know. P.S. 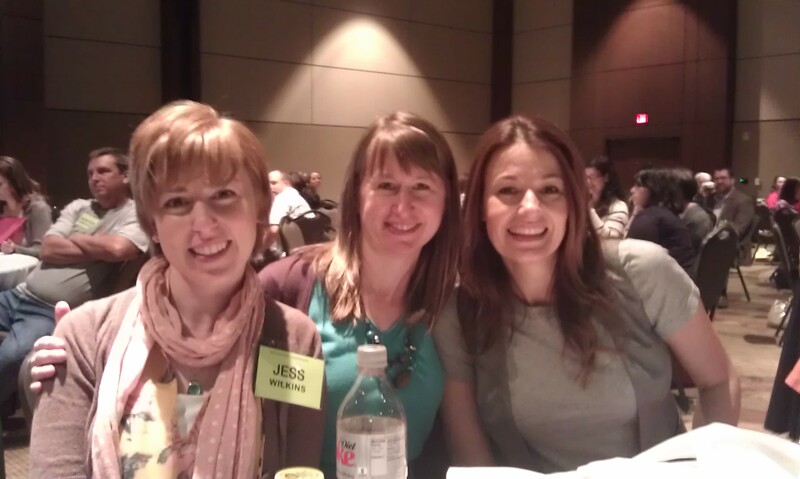 Have you checked out yours truly being interviewed over on Julie Glover’s blog? Well, go read it…. now. Hitchhikers. Are You Brave Enough? I heard on the news this morning that with the prices of petrol soaring through the roof, more and more people are turning to hitch-hiking. This sent a shiver down my spine. I mean, has nobody seen C. Thomas Howell‘s movie, ‘The Hitcher’? No? How about the remake with Sean Bean? If you haven’t, then you should. I remember back in 1980, I was holidaying with my family in California. My parents, who are supposed to know better, picked up not one, but two hitch-hikers. Together! What was they thinking? They’re parents. They’re supposed to know better. Luckily, these two men were not psychotic serial killers and we lived to tell another day. In fact one looked like David Soul… Maybe that right there should have convinced my dad not to stop and to drive straight past them. I pass many people, usually always men, thumbing for a lift along the motorways. Do I stop? Never. Do I feel guilty? Yes, of course. Especially if it’s hammering down with rain. But, here’s the thing. I write gore and creepy for a living. 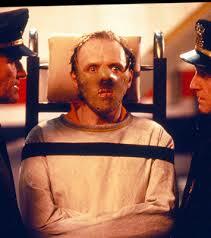 My imagination on the scare factor scale is right up there with Stephen King and Quentin Tarantino. Between me first seeing the hitch-hiker, and the hundred yards it takes to reach him, I’ve already played out the scene where he gets in the car, drugs me, and I wake up, hands and feet tied, in the boot. Believe me when I say you really don’t want to know what happens after that! When you pick up a hitch-hiker, you are putting a lot of trust in your judgement. Contrary to popular belief, not all hikers look like killers. Some actually look like nice, normal, trustworthy fathers and boyfriends. 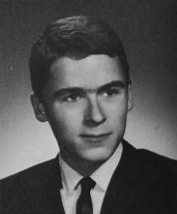 Just look at Ted Bundy’s high school Yearbook Picture. A few years back, I lived in Drymen, Scotland. To get there, I had to drive through a remote, barren area where there were no houses and I had no phone signal. One night, I had to stop on this dark, country lane, at a temporary traffic light. I saw no workmen, no ongoing road works. I was surrounded by thick, dense wood, with no cars in front of me, and no cars behind me. I was all alone. My headlights lit up little of the road in front of me but everywhere else was pitch black. What did I do? Started thinking about the movie, Urban Legend. I just cannot help myself. I am my own worse enemy. Half the time it’s not my surrounding that make me nervous. It’s my own imagination! We’ve all heard the legend. A driver is made to stop her car. While the car is stationary, an axe murderer climbs onto the back seat. Waits for her to drive off and then WHAM! Slaughter and blood on the wind-shield … I sure as hell wasn’t going to wait and see if my future ended with me being gook on my window, I can tell you. Nope, I keep my doors locked and my eyes peeled. I’m afraid when it comes to hitch-hikers, there is no way in hell I would ever pick one up. Male or female. 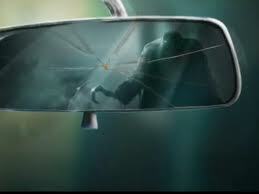 Those crazy killers can stay where they belong… on the road and in my rear-view mirror. Although, I did pass a woman once by a broken down car. I pulled over and asked (through a slightly wound down window) if she needed me to phone someone for her. She thanked me and said someone was already on their way. Phew. Total relief. With only days to go before the much awaited premier of James Bond’s, Skyfall, it seems the UK has gone into Bond frenzy. I passed Harrods yesterday, and the whole window was devoted to 007. It was only when I saw this video this morning that I realised just how far they had taken their obsession. And I don’t need any excuse to write about a handsome man with a six pack! As for the men’s reason? Who cares. As long as they keep churning out the movies, the female population will stay happy. Now, down to business. 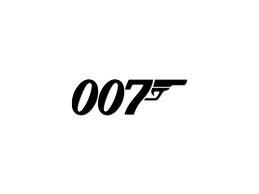 The best Bond. 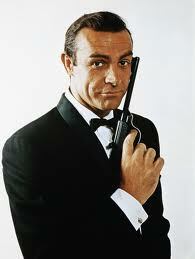 Connery was the first Bond way back in the 60’s with six movies under his belt. I found him arrogant and although I am a massive Connery fan, I don’t like him as Bond. George Lazenby made one movie, and I’ve never seen it. 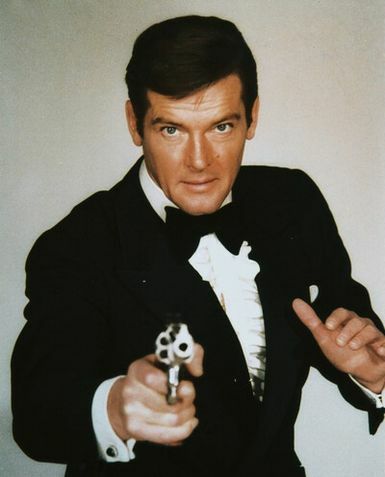 Roger Moore was the first James Bond I liked. character. This was the first time I saw Bond showing a little emotion. Hmm. 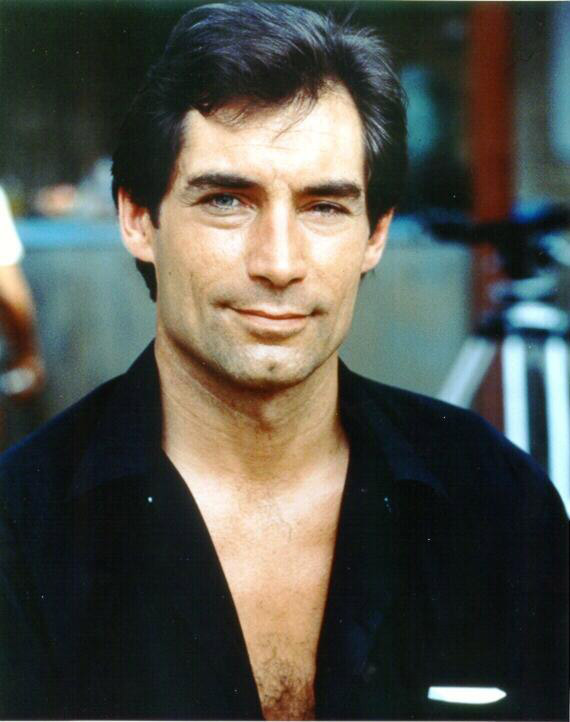 Timothy Dalton made two appearances as Bond. I think I saw bits of one. To his credit, some do say he was the best. Pierce Brosnan made four movies and was by far my favourite. I went into mourning when film bosses announced he would not return for a fifth. 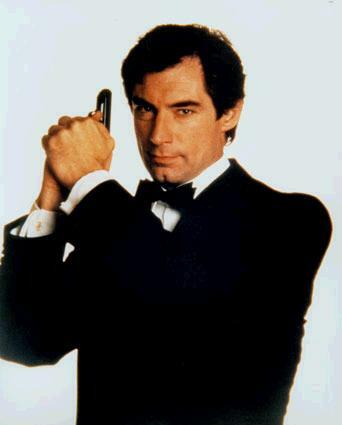 For me, he was the first Bond to show the character was actually capable of love, kindness and emotion. 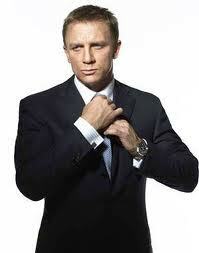 When Daniel Craig was announced as the new Bond, I refused to watch any more 007 films. Fifteen minutes into Casino Royale, I was in love and had found my new favourite Bond. Craig’s third Bond film is about to be released…. I’m as happy as a pig in mud. As for the worse Bond movie moments, check out my friend, Lewis Malka, over on ‘Top Left Design’s’ blog. Lewis is definitely a James Bond fan who has taken things way too far. Now, who do you reckon would still be standing if there was a Battle of the Bonds? So, who is your favourite James Bond? And why? Also, do you have a best and worse moment in a Bond movie?